Media personality and political pundit Ann Coulter re-tweeted a post from Twitter that appears to provide further evidence that political cadres are infiltrating Trump rallies. Over the March 12-13 weekend, Republican frontrunner Donald Trump accused Sen. Bernie Sanders of being behind infiltrators who disrupted a pro-Trump rally in Chicago on March 11. However, evidence is emerging – circumstantial and otherwise – that leftist groups and Democrats are the “disrupters” to whom Trump was referring. The tweet offered by Coulter shows a photograph of what appears to be a type-written set of talking-points to be used by Trump’s opponents. 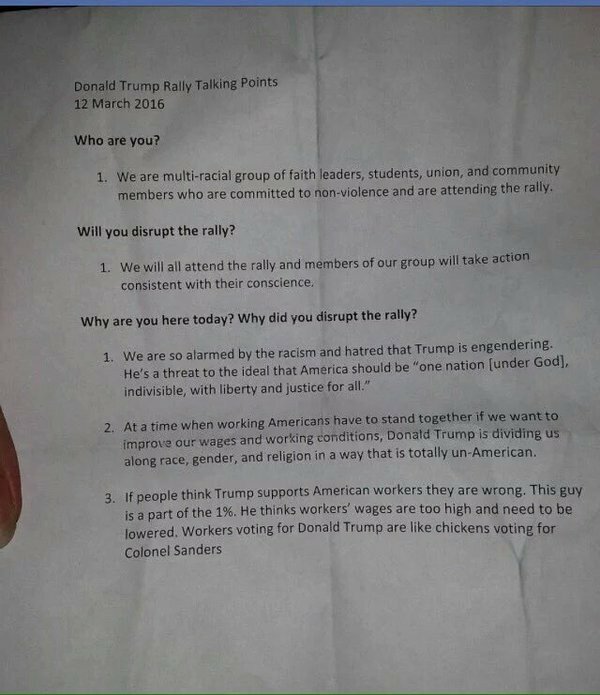 It is dated March 12, 2016, and is entitled “Donald Trump Rally Talking Points.” It provides three answers to possible questions from the media and others about the presence of anti-Trump protesters. Moveon.Org is a leftist organization that receives funding from George Soros, a billionaire of Hungarian origin who is an American citizen. The group is capitalizing on the protests in Chicago to raise funds. 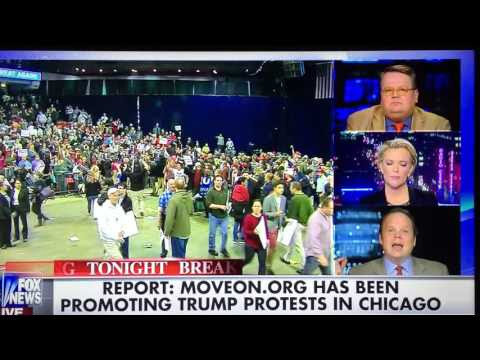 According to a March 12 MoveOn fundraising message, “Last night, without consulting local police, Donald Trump abruptly cancelled a rally in Chicago in the face of massive and overwhelmingly peaceful student-led protests.” It added, “We’re being flooded with aggressive emails and social media posts from Trump supporters. Some of them are threatening. We refuse to be intimidated by Donald Trump, Fox News, or anyone else.” The group has been one of the most active in protesting Trump at his rallies. Among the other groups protesting against Trump is Black Lives Matter, and several Communist groups. ANSWER Chicago is a local unit of an international network of leftists that emerged after the terrorist attacks of 2001 and was one of the first groups to protest the war in Afghanistan. Since that time, ANSWER has been involved in anti-capitalist demonstrations. It is in favor of labor unions and open borders. In a Facebook page, “We will have a report back from the People’s victory against Trump last night,” according to coordinator John Beacham.